I’m really glad to review again a wig from L-email wig. I love their wigs! All their wigs are really thick, soft and really good quality! 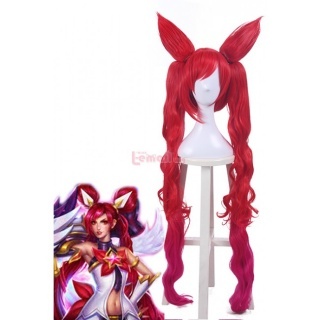 This time I’ll review the Star Guardian Jinx wig. Sono molto felce di recensire nuovamente una parrucca di L-email wig. Amo le loro parrucche! Tutte le loro parrucche sono foltissime, morbidissime e di ottima qualità! Questa volta recensirò la parrucca di Jinx in versione Star Guardian. It was sent to me on December, after winning their giveaway. Delivery was AMAZING; wig took just two weeks to arrive! Mi è stata spedita a Dicembre, dopo aver vinto il loro giveaway. La spedizione è stata SPETTACOLARE; giusto 2 settimane e mi è arrivata a casa! I love the way they split hair on the wig and the scalp that is so well made that seems real! The way ponytails fade from red to purple is gorgeuous! Adoro il modo in cui i capelli siano divisi al centro della parrucca e quella base che fa sembrare l’attaccatura quasi ”reale” senza far vedere retina o altro! Il modo in cui i ponytails sfumano dal rosso al viola è spettacolare! Wig is really good quality but I noticed some little problems , maybe being one of the first wig made ( I remember that this was new in store from 1-2 days when it was sent to me), so maybe it is not a common problem but just a problem of my wig. La parrucca è veramente di ottima qualità ma ho notato alcuni piccoli problemi, magari essendo una delle prime parrucche create ( ricordo che mi è stata spedita 1-2 giorni dopo che era stata messa nello store), quindi magari non è un problema comune, ma giusto solo della mia. ◊ Wig fringe was a mess, because it has to much hair and I couldn’t take out of my eyes without cutting it ( at the end I shortened it to much, but my fault) and styled it with a straightner. ◊ La frangetta era un casino dal momento che era troppo folta e non riuscivo a sistemarla in nessun modo sul viso ed ho dovuto tagliarla/sfoltirla ( ma alla fine mi sono fatta prendere la mano dal nervoso ed ho tagliato un po troppo, ma colpa mia) e l’ho anche un minimo piastrata. ◊ Hair buns had these kind of mini metal combs to get into the wig base, but they are not very good, because with some few movement of the head it is possible they fall of and they are also really difficult to put on the wig. It will be better if there were some clips. ◊ I codini spyke(?) (quelli corti per intenderci) hanno questi pettinini per essere attaccati alla parrucca di base, ma non mi sembrano molto buoni perché con pochi movimenti della testa è possibile che stacchino, inoltre sono difficilissimi da inserire e far stare sulla parrucca. Sarebbe stato meglio se ci fossero stati i classici fermaglio/clip. ◊ Wig is very heavy and slips to the back, going beyond the hairline of the forehead most of the time. I’ll try to fix this wig some wig glue or wig tape. ◊ La parrucca è molto pesante e scivola all’indietro, facendo si che stia per la maggior parte del tempo oltre l’attaccatura dei capelli naturali. Penso che sistemerò questo problema con un po di colla per parrucche o strisce biadesive per parrucche. However, this doesn’t mean that wig is bad quality or nothing like that! Take it as a tip if you get same problems with this or another kind of wig! Comunque, questi piccoli problemi non stanno a significare assolutamente che la parrucca è di bassa qualità ne niente de genere! Prendete queste note come promemoria in caso di problemi simili con questa o qualsiasi altra parrucca! I really recommend this wig because I think it is THE BEST you can find and it’s also really cheap! 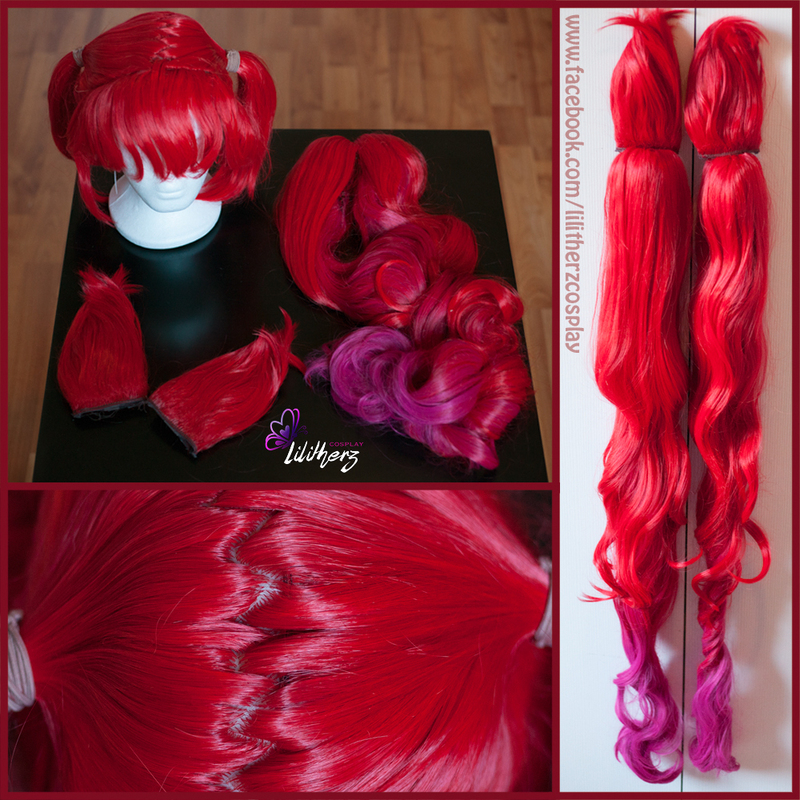 Get your favorite league of legends cosplay wigs from L-email wig. Keep updated on my Star Guardian Jinx costume progress on my Facebook page! Raccomando veramente molto questa parrucca perché penso sia LA MIGLIORE che potete trovare online, inoltre è veramente economica! 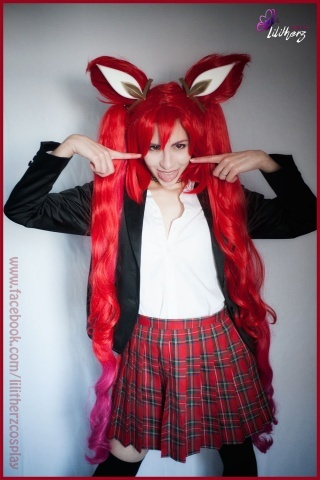 Mantenetevi aggiornati su i progressi del mio costume da Star Guardian Jinx sulla mia pagina Facebook! 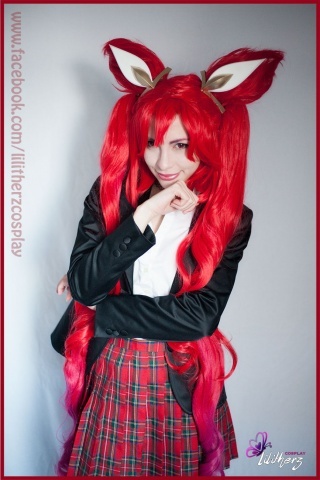 This entry was posted in Buy Cosplay Wigs, Fashion Wigs, L-email Wig review, Wigs, Wigs Hairstyle Selections and tagged anime cosplay, anime cosplay wig, anime wigs, best cosplay wigs, black cosplay wigs, cheap cosplay wigs, cheap wigs, colorful straight wigs, cosplay ideas, cosplay store, cosplayers, L-email wig review, L-email wigs, pink color wigs, straight fashion wigs, wig store, wig-supplier reviews, wigs.